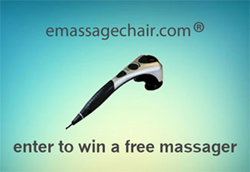 To celebrate Everybody Deserves a Massage Month, Emassagechair.com is giving away 5 handheld massagers. Emassagechair.com wanted to get involved in the efforts to advocate healing through alternative medicine and are giving away 5 handheld massagers from now until July 31st. Everybody Deserves a Massage Month was created to inform the public about the therapeutic benefits of massage. Massage promotes health and wellness through many benefits such as healthy sleep, stress relief, reduction of depression and anxiety, alleviating pain, boosting the immune system, and eliminating toxins from the body by stimulating the lymphatic system, to name a few. Emassagechair.com wanted to get involved in the efforts to advocate healing through alternative medicine and are giving away 5 handheld massagers from now until July 31st. The wellness company will give away 5 Osaki OS-102 Dual Head Handheld Massagers. The OS-102 can be used on aches and pains all over the body and has 3 interchangeable massage heads to give a unique feeling to the massage each time. The massagers also have a frequency dial so that the user can increase or decrease the intensity to their comfort. The OS-102 has an easy grip handle and is lightweight for ease of use. The handheld massager is a great tool and is terrific for those on the move as it is small enough to fit into a small suitcase or tote bag. For a chance to win a handheld massager, visit their Facebook page for the giveaway details. The giveaway winners will announced on August 1st. If you have any questions about the giveaway, Ask an Expert at Emassagechair.com by calling 888.360.9996.